This quote – from a colleague here at NASA – sums up what inspired me to take a giant leap from a digital newsroom to the mission operations center for the July 2015 New Horizons Pluto flyby. I’m Laurie Cantillo, and as media liaison in the Office of Communications at NASA, my mission is to tell the story of the agency’s planetary missions. As NASA’s media embed with the New Horizons science team, I had a front row seat to an unforgettable adventure. 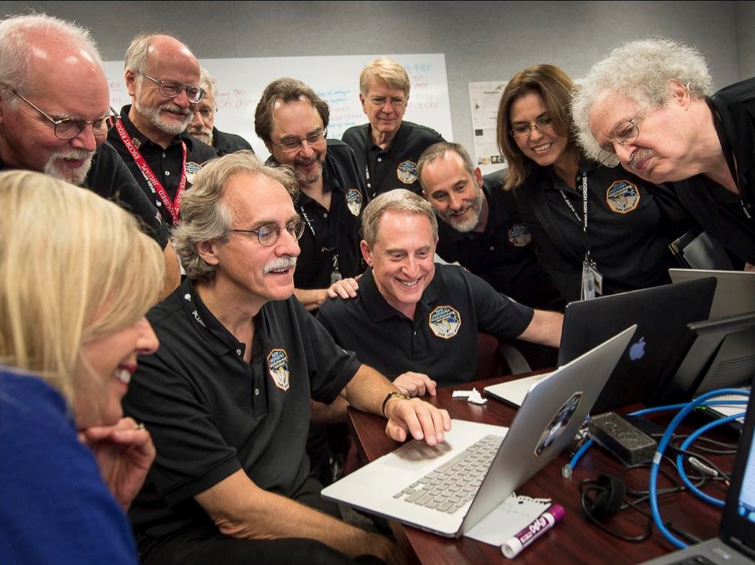 Working in a makeshift newsroom last summer at the Johns Hopkins University Applied Physics Lab (APL) in Laurel, Maryland, we were at the epicenter of this historic journey, as new images and other data of Pluto and its moons were downlinked after a 4-and-a-half hour journey from the spacecraft. The energy in the room was electrifying when new data would hit the ground and scientists would gather around a computer screen to gape, interpret, and marvel about humanity’s first views of this strange, distant world. Scientists, mission operations, engineers, and writers all worked insane hours – often 18-20 hours a day for months without a day off – catnapping on a conference room floor or in someone’s empty office. We drank a lot of caffeine and had pizza delivery on speed dial. The most anxiety-producing period of the summer came the afternoon of July 4. While the nation was grilling hot dogs and preparing for fireworks, Principal Investigator Alan Stern burst into the newsroom saying, “We’ve lost contact with the spacecraft.” My heart skipped a beat as he hustled to mission control—it was all hands on deck. The spacecraft had recognized a problem and, as it’s programmed to do, switched from the main to the backup computer, going into what’s known as “safe mode.” Working around the clock and sleeping on the floor, the mission team raced against time to bring New Horizons back to the main computer, so the final command sequence for the flyby could be loaded. The scientists labored over a caption with a few specs and contextual quotes, and broke for lunch. Then it was my turn to add the storytelling, taking the numbers, acronyms and geological jargon and weaving them into a colorful narrative. I wrote a headline about the “heart” of Pluto, and soon after that Pluto went viral, far beyond the usual loyal community of space fans. Pluto was already beloved by many because – after its demotion by astronomers from planet to dwarf planet – it became the “little-planet-that-could.” But after it was revealed that Pluto had a “heart,” the story went mainstream, attracting global attention. 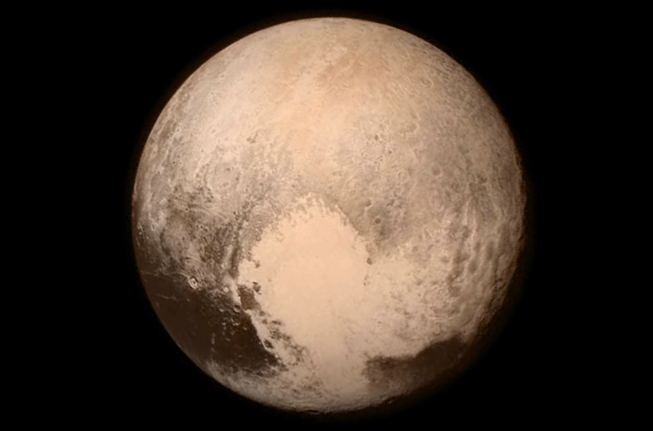 In the summer of 2015, the world “hearted” Pluto! The New Horizons mission became the perfect media storm. You had to be living under a rock to not know that America had a spacecraft exploring Pluto, a mind-bending 3 billion miles away. NASA, SwRI, and APL’s amazing communications, education and outreach teams further spread the news through social media, at NASA centers and museums, at Plutopalooza events and NASCAR races. People from all over the world took photos at dawn and dusk – simulating the amount of sunlight on Pluto – for #PlutoTime. We collaborated with Google on a July 14 Doodle. Images of Pluto were projected at Times Square. 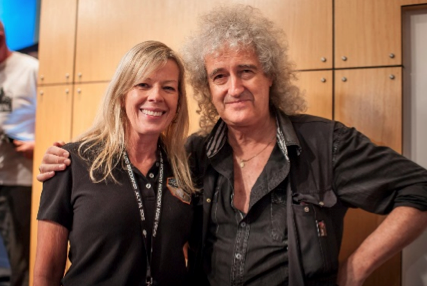 The group Bastille produced a video greeting, astrophysicist and Queen lead guitarist Dr. Brian May went backstage with the science team, and the band Styx traveled to APL, posing for photos with the New Horizons team, including Mark Showalter, who discovered Styx—one of Pluto’s moons. The media’s appetite was insatiable, and we were bombarded with hundreds of interview requests. 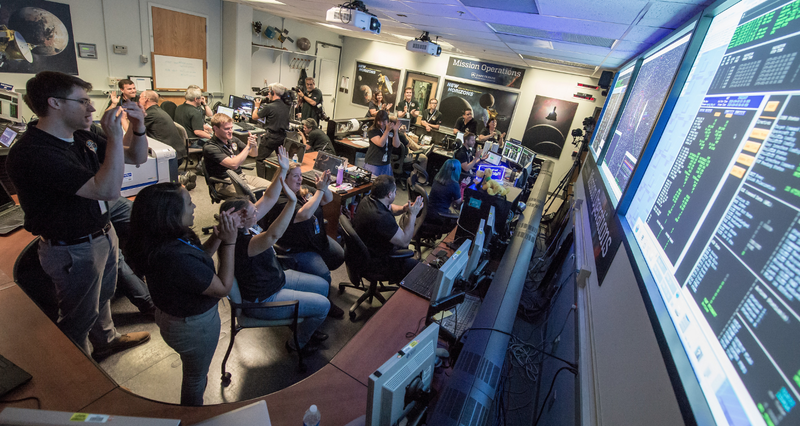 On the evening of July 14, the crowd at APL went wild as we received word that the New Horizons spacecraft was healthy and the mission was a success. On July 15 – the day after the flyby – the Pluto story was on the cover of more than 450 newspapers in multiple languages. Countless kids sent drawings of Pluto and wrote of dreams of being astronauts. Congratulatory messages poured in from people who said the mission inspired them at a time when there was so much bad news in the world. Stephen Colbert and Neil deGrasse Tyson debated whether Pluto was a planet. Pluto became the subject of dozens of memes. My favorite (about 0:55 seconds in) personifies little Pluto as it eagerly anticipates the arrival of a spacecraft in that lonely part of the solar system. As New Horizons flies by, Pluto sheds a tear and its heart “breaks,” a nod to the different surface composition of each side of Pluto’s heart feature. Nine months after the flyby, the New Horizons team continues to produce new images with analysis every week. Interest in the mission remains high; pictures of the “little-planet-that-could” are among the most popular features on NASA.gov. Covering the New Horizons mission is an example of how NASA’s Office of Communication strives to bring you the stories behind the missions. Yes, it IS rocket science with mission design, data analysis and scientific information, but it’s even more about vision, leadership, perseverance, and celebrating the REAL heroes of our time.